Elka de Wit started her own ethical cosmetics brand after discovering a miracle cure for her skin problems. Registered as a community interest company (CIC), 34.4 donates 3.44% of every sale to the Natural Beekeeping Trust, which promotes sustainable beekeeping. 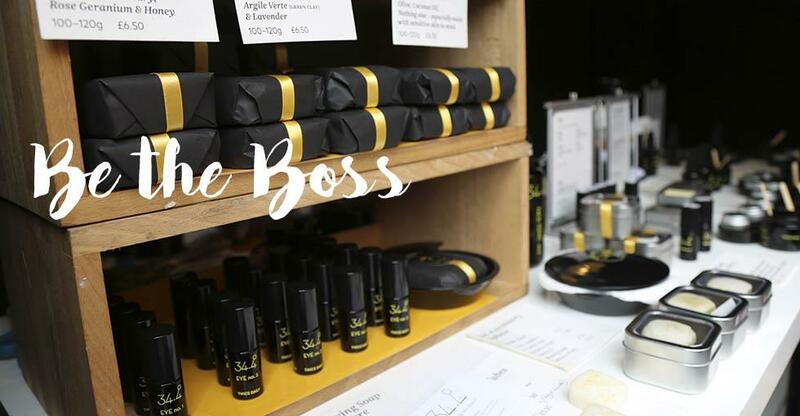 We spoke to Elka at her new stall in Cleve Courtyard, Shoreditch about her socially-conscious skincare company. Can you tell us about your background before your business came into being? I’m actually a trained actress, but I also had a business in the mid-90s selling crafted greetings cards. I did this for 40 artists, including myself, and we sold them to big retailers like Harrods, Fortnum and Mason and Liberty. So I have quite a good background in dealing with retailers of artisan products. We’ve been trading for a year and a half now. Initially, we were going to start up as an online company, but then we realised that, actually, people want to try out skincare; you cannot just sell it online. I started making products from home about five years ago because I had pretty bad skin. I started with one product called honey balm and it actually cured my skin problems. I now have five products in the eye range, four products in the skin, face and moisturising range, three types of soap, three different tonics... but they’re all multipurpose. We’ve been trading at Broadway Market [Hackney, east London] in the schoolyard since January last year and we started here in March. We did really well in our first year. We get a lot of repeat business, which is why it’s good to stay in the same locations – people come back. Also as a result of that, the online business is kicking off now too. Why did you call it 34.4? We use honey and beeswax in quite a lot of our products and 34.4 degrees is the optimum temperature for the brood to develop. We also donate 3.44% of every sale to The Natural Beekeeping Trust in order to educate people on how to keep bees in a sustainable way. This means that we don’t take all the honey off and then feed them sugar. We only take a little bit off and make sure they have enough to get through the winter. What makes your skincare products different from others? First of all, we started it as a social enterprise. There isn’t another skincare company that has a range as wide as this as well as doing projects that help people, the environment and the community. We use honey and beeswax, but we’re actually branching out into vegan skincare as well. What are the biggest challenges you’ve encountered and how have you overcome them? I started working with someone who works in branding. I worked with him for three or four months. After this time I realised that he didn’t really understand the product and where the company was going. We pulled the whole thing back just before we were about to launch. It was going to be called something completely different. We just figured that it wasn’t going to work and it took us another six months to create this look with another designer. I took a big step back, did a lot of walking in the park, a lot of yoga and meditation, and I realised that I actually already knew the designer, I knew what kind of a person he was, so I went to him. We both like art deco. I knew I wanted everything in black and he suggested that we go with this gold, almost art deco look. You have to work with people that you genuinely get on with, that you genuinely share values with, otherwise they don’t understand you or the product and then every meeting is a bit of a chore. You have to look forward to meeting up with them and coming up with ideas together. What one piece of advice would you give to others looking to start or buy a business? Take your time, don’t rush things and don’t go to market until you really feel comfortable with what you’ve got. Every single day I stand either at my stall or in the shop and I’m really proud of what goes into my product and what my product looks like on the outside.